Blue and Gold hospitality and spirit filled Caesar Rodney High School today during the CR Rider Pride Day. There was plenty of pride showcased by the district that is known by it's tagline..."a Tradition of Excellence." Today's event added one more claim to that! Demonstrations and exhibits by clubs, activities and special groups from each school in the district clearly showed the depth of pride and excellence in this district. 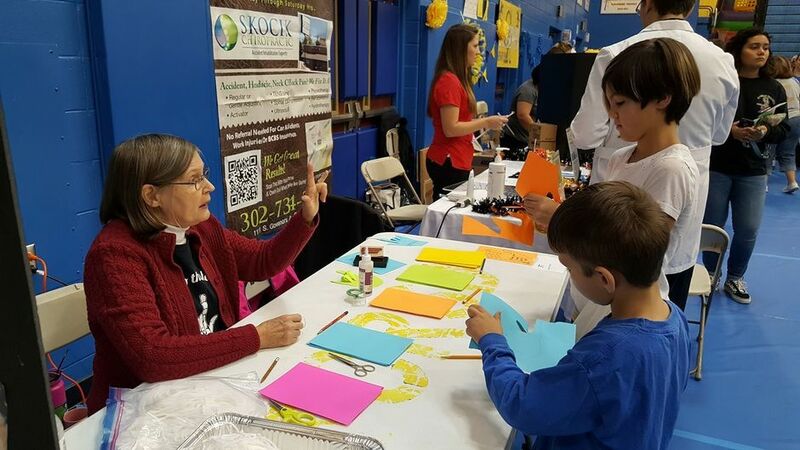 The district also invited local community groups and organizations to participate in showcasing their services, many of which directly support and engage students. 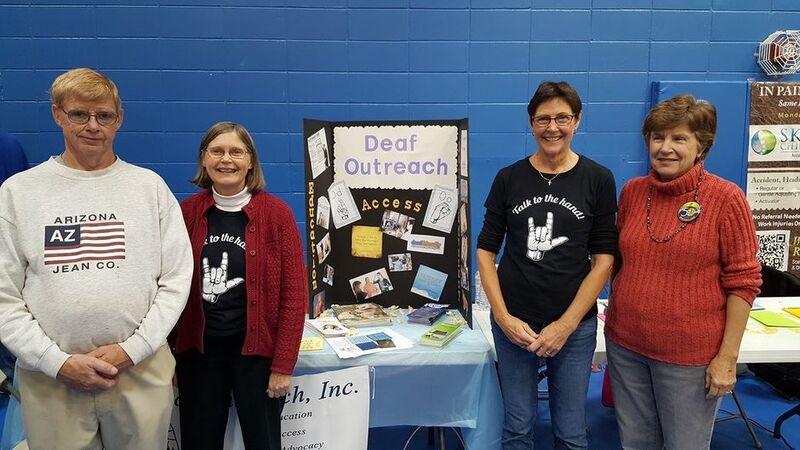 Deaf Outreach, Inc. was among those local organizations who had a display table at Rider Pride Day. 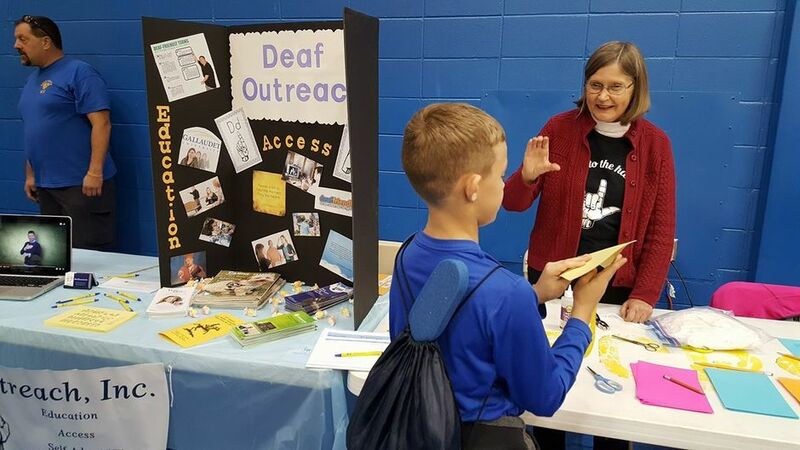 This was the first appearance of DO, Inc. at Rider Pride Day and we'll be back again next year because of the interest generated in American Sign Language of those who stopped by our table. Conversation, information about services for the deaf and ASL class offerings and a craft opportunity to make a paper ASL "I Love You" hand-sign were some of the things the 4 volunteers for DO, Inc. did today for the visitors. The Fabulous Four: Carl, Carol, Sue, and Patti. Carol teaching the ASL Alphabet. 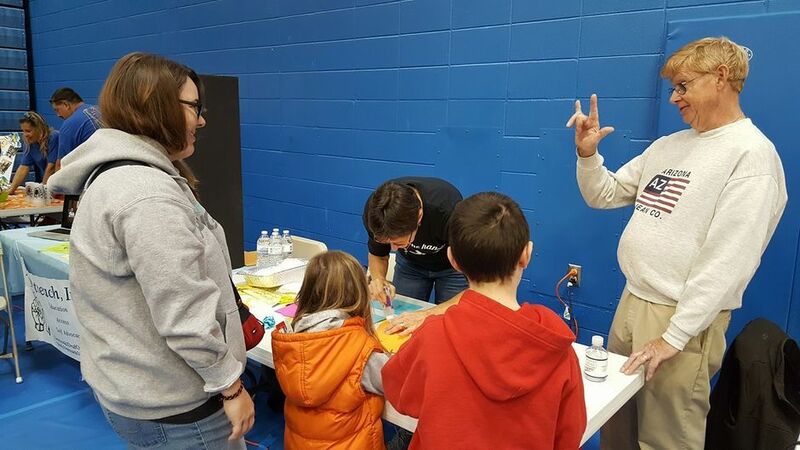 The best part of our time at Rider Pride Day for this writer was the interest and ability of the young children to learn American Sign Language. When we showed them how to finger spell their names and a few conversational signs, their faces lit up with enthusiasm! Young brains absorbed this new language so easily! It makes this old retired educator think that ASL should be required in school. Wouldn't it be wonderful if the younger generation, who learn quickly, would learn ASL as part of their universal education? Then they could teach simple ASL to the senior population whose hearing most likely will go bad? Intergenerational communication and learning - with the tables turned - at its best! Not to mention the benefits to the population who are deaf! Carol teaches the ASL sign for "I Love You" while helping with a colorful ILY craft.